February is here and I’m just getting to my first Blog of the new year. Some folks think I’ve been hibernating like a bear. Actually, I’ve been quite busy cooking, exercising and performing at corporate events and private parties almost every weekday and weekend since New Years Day. Many shows were for repeat clients. It always tickles my heart when they call me back again, year after year. During the Christmas break, my wife and I invited some family and a magician friend, Scott Alcalay over for dinner. 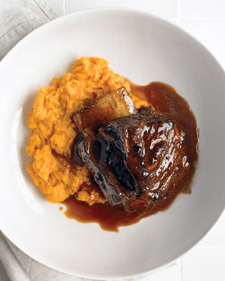 That night I cooked one of my favorites dishes, Root Beer Braised Short Ribs. I found the recipe from Martha Stewart Everyday Food Magazine. Here’s a link to the recipe. I love to cook as much as I love to perform. And I look at cooking the same way I look at performing. You must have a great recipe, a good grasp on cooking techniques, the right equipment and a good understanding of cooking techniques in order for your food to taste great. Likewise, you have to understand the principles behind magic and showmanship, have good material and a solid understanding of theater to make your magic entertaining.There is nothing worse than boring your audience. It’s like serving them tasteless food. As a magician, you must understand basic magic skills to perform your craft. On stage, you must know how to entertain, how to get attention and tell a story. It’s imperative that you are able to make the magic appealing and engaging to get the maximum audience impact and to ”wow” the crowd. If they like your magic, then they will have you back the next year. The same goes for cooking. You have to understand techniques about pre-seasoning the meat, browning the meat, deglazing the pan to capture all the flavors at the bottom of the pan. Add the right amount of herbs and vegetables to further develop the flavor. And you have to have the right oven temperature to slowly braise the dish. It’s the slow cooking that makes the meat tender. You have to understand about building flavors in the pot as the dish is developing. When you present your dish to the ”audience” it has to appeal to their taste as well as to their eyes. Food should taste just as good as it looks. Would you not agree? I’ve heard it said, they people eat first with their eyes. And I believe it. If you like to cook, do you take into account how you present your meals? Do you make use of color on the plate as well as on the table? Here’s an easy tip, to add a bit of color and flavor to your pasta dish; just sprinkle a chiffonade of fresh basil over the top. Stack the basil leaves together. Roll them up lengthwise, then slice them into thin strips. Shred some real Parmesan cheese top first, then place a big pinch of basil on top in a small heap. And sprinkle more around the plate. It’s really that simple. With a few simple touches, your friends will be more impressed with your cooking. And they’ll want to be invited back again and again for more. Hey, just use the word, “chiffonade” and your friends will be impressed with your vernacular.